Deezer Music Streaming Service Launches Nationwide in the U.S.
French music streaming service Deezer officially opened its doors to the U.S. market on Tuesday, meaning for the first time, anyone in the States can sign up for a $10-a-month subscription. Previously the service was only available to U.S. customers if they owned a Sonos system and paid $20 a month for Deezer Elite, or if they signed up to promotion deals through Bose and Cricket Wireless. 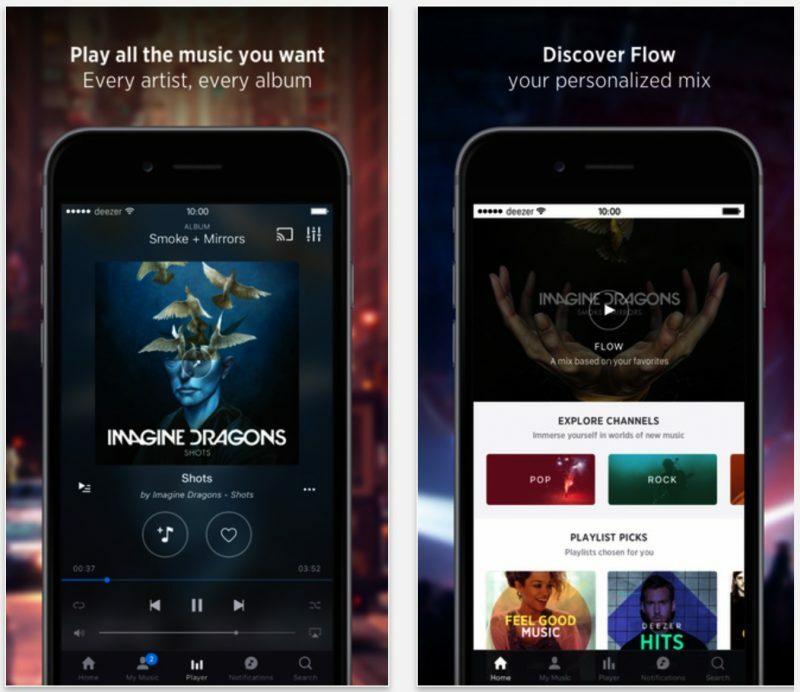 A Deezer Premium+ subscription offers similar features to Apple Music and Spotify, such as unlimited streaming of its 40 million-track library, machine-generated and human-curated playlists, offline listening, and access to music lyrics. Over 40,000 podcasts and radio stations (including personalized station service Flow) are also included. Deezer offers an ad-supported free tier in other countries, but users in the U.S. only have access to the paid tier. A 30-day free trial is available however. iOS users can avoid the App Store surcharge for signing up to the service through the Deezer app ($12.99 per month) by visiting the website instead, where the Deezer Premium+ 30-day trial is also available. Users then pay $9.99 a month and can cancel anytime. The Deezer Elite high-definition service remains exclusive to Sonos speaker owners. Deezer currently has over 6 million users worldwide, about half that of Apple Music and around a fifth of Spotify's total paying customers. The service will also have to compete with the likes of Tidal and Google Play, as well as online radio station Pandora, which currently has over 80 million free monthly listeners. I'll save my American friends some time & money: don't bother. Deezer is rubbish compared to Spotify. I got 6 months free with my mobile provider and decided to cancel my Spotify Student membership to save a little bit of money while the Deezer trial was going on. I lasted about a month and a half before I re-subscribed to Spotify. At the basic level, it offered me the same content but at no cost for 6 months. However the interface was poor, the Mac app needs to be 'Force Quit' every time, and it lacks Spotify's fantastic connect feature. I see literally no reason why you would want Deezer over Spotify or Apple Music, unless you get it free for an extended period of time and don't mind its inferior interface & feature set. Why is this even on the front page? I actually quite like Deezer. It takes some time to train it but then the "Flow" feature works really well. Most of the time I just press "Flow" now and Deezer plays music I like. Spotify's iOS interface is horrific. Deezer is far more pleasant to use. I did the Apple Music trial and that was awful too. I and all of my friends are still with Deezer. Another music service? I think the market was over crowded before them, now its saturated. I think we're ripe for a shake out or consolidation. We only have like, what, 6 companies to choose from? That is not overcrowded, we need some good competition in this space. Man. You can get over 12 months of free streaming music just by using all these intro offers. Guess that is not too bad. More of the same. When they sign up exclusive deals with artists, they'll then show their only unique reason to sign up. It's a shame that the music industry is fragmenting like this with the only way to get a piece of the pie is to block content to other service providers. I also have this on a 6 month freebie and I echo the disappointment in its clunky interface. Flow is just another 'Genius' that suggests stuff you never want to hear. The worst is the constant spamming, even after you disable notifications and all contact via email. I shall not be renewing and barely use it even now.